In 10-inch nonstick skillet, heat oil over medium heat. Add onions and green bell pepper; cook 3 to 4 minutes, stirring occasionally, just until tender. Add ground chicken; cook 4 to 5 minutes, stirring frequently, until chicken is no longer pink. Add tomatoes, olives, raisins, oregano and pepper; mix well. Cook 7 to 10 minutes, stirring occasionally, until most of liquid has evaporated. Meanwhile, cut yellow bell peppers in half; remove seeds and membrane. Place on microwaveable plate; cover with microwaveable plastic wrap. Microwave on HIGH for 4 to 6 minutes or until tender, rotating plate halfway through cooking time. 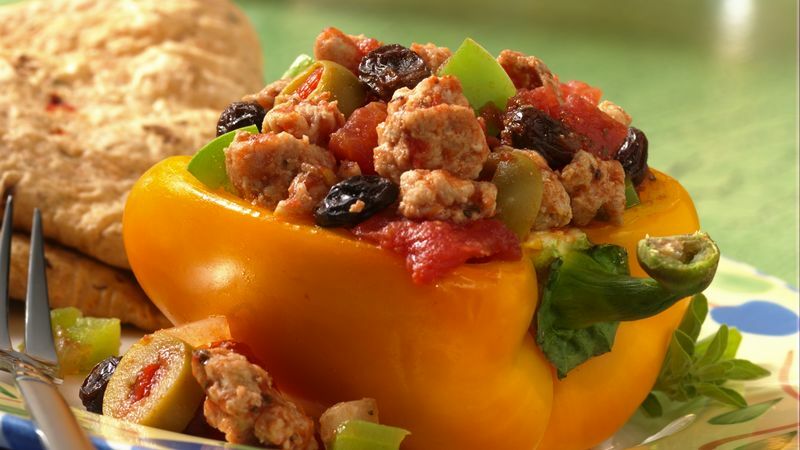 Fill cooked bell peppers with hot chicken mixture.